In 1986—I think, as that was a long time ago, after all—the year that Elvis Costello and the Attractions put out Blood and Chocolate, they went out on tour in support of the record. I saw them at the Michigan Theater in Ann Arbor. Costello took on the guise of Napoleon Dynamite—his character, which (obviously) preceded that of the film of that name—during the show. He allowed audience participation. There was a large roulette-style wheel set up with names of songs on it. Spin the wheel and get your tune performed. 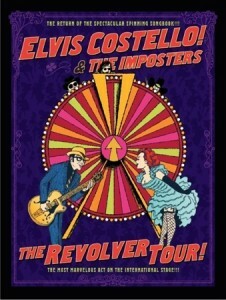 And now Elvis Costello and the Imposters are out on tour in support of The Return of the Spectacular Spinning Songbook!!! I have seen Costello play umpteen times. I know that as a GloNo participant I should have that number down cold. But it is a number sufficiently high that I had written here back in 2005 that I’d seen a show done so well that I probably wouldn’t see him again. Guess what? Saturday night was better by a big factor. Napoleon Dynamite made a return appearance. There was the spinning wheel. There was audience participation. There was a go-go dancer who is drop-dead gorgeous. I’d never seen a go-go dancer live before. She was so incredible, I don’t need to see another one again. Not that I’d mind. But “Dixie De La Fontaine” moved so exceedingly well, that it would be hard to imagine her being bested. There was a hostess, “Katarina Valentina Valentine,” who brought participants to the stage. Yes, there was the band up there, as well—Nieve, Thomas, Faragher—and they did a spectacular job, as this was a spectacle (no, not referencing Costello’s chat show of that name). The crowd at the venue in the Caesar’s Windsor Casino was appreciative and engaged, yet polite and reserved: They watched the show, as a show it was. 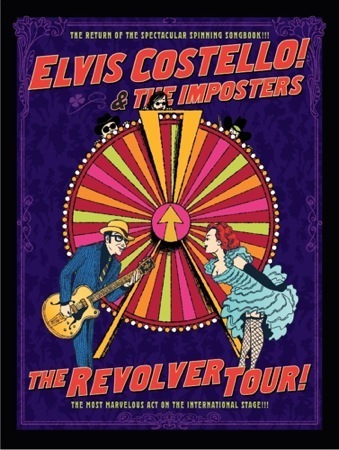 And in the case of what Costello did, it was a “show,” and he gets the whole vaudevillian aspect of what that means, all the way to talking patter when doing setups between the bits. The music. Here I go back to This Year’s Model and Trust and Imperial Bedroom and Punch the Clock and. . . .
Costello has a fulsome catalog. A rich variety of music. But in this case, it was a show of the rock and roll done slow (e.g., “Allison”) and fast (“Radio, Radio”) and all tempos in between. It was the stuff of then. And for many of us, then was better than now. But it didn’t seem like a revival tour, a retro act. It seemed very much of the moment. It seemed like this year’s model. Previous PostSummer Camp Music Festival: MP3 SamplerNext PostNew songs from Fiona Apple and Liz Phair: Do you believe in third chances? Nice. I saw him last year when he was doing a spinning songbook tour, too. Royal Oak Music Theater, I think. Great show, for all the reasons you highlight in your post. Would love to see him again. I saw them a couple of weeks ago here in Vancouver. Awesome show. Radio, Radio was amazing, but my favourite was probably Beyond Belief. So good!